I received another sweet blogger award. 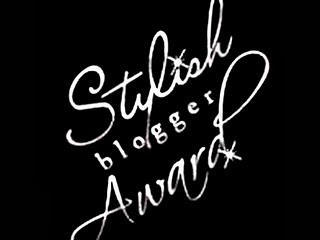 Laylah from Blue Abaya (a Scandinavian princess in the magic Kingdom) awarded me the Stylish Blogger award. Thank you Laylah! I always enjoy reading your blog and really appreciate the referrals you sent my way by nominating me! 1. I bite my nails. More when I am stressed… obviously. I started because I wanted to copy my older sister and have not been able to stop. I have periods of time when I grow them and get manicures and make them look pretty. Those times I think “I can’t believe I ever bit my nails! Thank God that’s over!” but deep down inside I know it’s a lie. 2. I have a stuffed toy bunny rabbit called Arthur. I saw him in a tiny toy shop one summer when I was about 10 I think but didn’t have enough money to buy it. My cousin, who was with me, bought it for her self but eventually gave it to me. I like to think there is only one of him out there (Will post a picture once I unpack him from the cardboard box he has been in since we started renovating our house!). I bestowed him upon my son and then my daughter but neither saw the enormity of the gesture and I ended up finding him unceremoniously dumped in different parts of the house. I will try with Baby B when he is older. 3. When we were kids, my best friend and I climbed up to the roof of my grandmother’s house with some ice cubes and an NKOTB pin with the purpose of piercing our ears. We came down 20 minutes later, mission unaccomplished, probably needing a tetanus shot. 4. I constantly make up stories to people who I know I will never meet again (Taxi drivers, shop assistants, airline staff, etc). I don’t pre-plan it or anything, but my immediate answer to any question they give me is a flat-out lie. It’s so much fun! The weirdest thing is when I once got a pang of guilt for some reason for lying to a cab driver in London so I confessed that I lied (It was about something stupid in answer to the question “What have you been up to today?”) so my confession left him confused and he refused to talk to me the rest of the way home. I can’t say I blame him. 5. I spend ridiculous amounts of time planning diets in my head in such detail that I imagine how much weight I will lose and how fantastic I would look and how I would fit into all my old clothes but I never actually start the damn diet. 6. I am looking for a writing course this summer but am terrified of having to read or write in front of a class room. Add to that the fact that I don’t even know what genre of writing I want to do! How pathetic would it be to do an online course? 7. I went online 2 and a half hours ago with the intention of quickly checking my mail then jumping into bed and now my eyes are burning and I am so passed tired I cannot imagine walking the 12 paces to get to my room from the couch. I not only wrote this post (Which I am sure I will be editing heavily tomorrow seeing as I probably do not write so well half asleep) I have also included a nifty little poll that will tell me a lot about the people who read my blog, or tell me nothing but it’s interesting to me anyway. 15 is a big number so I will just add the ones I have read lately: Blue Abaya, Dentographer, Driver Diaries (Came across this due to Blue Abayas post. really funny). An Eye on Saudi (Also just found this today) American Bedu (Not recently discovered but one of the best) Lost In Riyadh, Kloppenmum and many many more. I will add more tomorrow when the internet is not so slow and I am not so sleepy! I am going to do just that, just as soon as I wake up! Lol yes, when you click NKOTB it redirects you to a sight about them. So does that mean you know who they are? Thanks again. :) What a lovely welcome back to the blogosphere.